One of the key features of Business Objects Enterprise XI 3.0 is the ability to produce multilingual metadata and reports from the same universe. 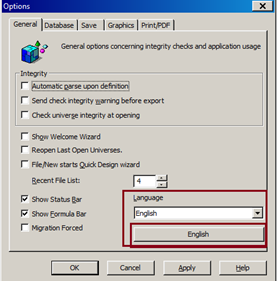 This feature enables the user to have a one-step multilingual reporting solution that is locale sensitive, supported by a single metadata universe model and provides full Unicode support. Reports then can be built once from the same universe and run and generated in several languages based on user preferences. Some languages are associated to several countries. At the same time a country can be associated to several languages. Note: To avoid any confusion in the documentation and the application, language and locale use the same term “language”. – This is the Designer user interface language. – The menu and messages appear in that language. – Designer can display localized metadata. – Designer has its own Preferred Viewing Locale (PVL) that defines the locale of the metadata displayed in the Designer workspace. Tools > Options settings of the Universe Designer tool, choose a Language from the list if available languages, this is the product language, also known as the User Interface Language (UIL). There is no impact on the universe metadata: object names, context names, and classes appear in the original language of the database elements. Document language – The language set by you when you create the document (Report). Preferred viewing locale (PVL) – This is your preferred viewing language settings. This defines the language in which strings, text and format – the parts of the resource (document or universe) content or attribute list – appear in the application on InfoView or Web Intelligence Rich Client. Substitution (Fallback) language – This is a default language when there is no viewing language or preferred viewing language in your system. Source language – When you add a new language to the document strings from the source language. The multilingual universe impacts the universe metadata. Designer uses the *.unv file format that contains an additional XML stream that is generated for additional languages. You can set the Universe Designer interface to display in other. The list of available languages can be found in the menu: Tools > Options. • Use Translation Manager to either directly translates the column headings for the universe document or to export the text in an XLIFF file for external translation. The localized XLIFF file can be imported into the universe when the file has been translated. The metadata-localized information is imported in an additional XML stream part of the .unv file. 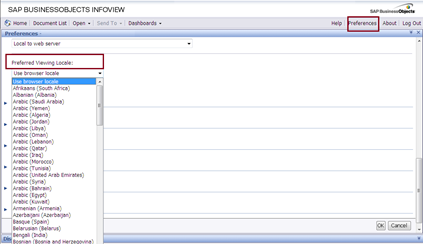 • You can view the multilingual information in a Web Intelligence document or a Crystal report. 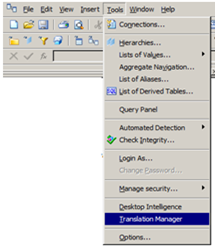 The Translation Manager is a stand-alone application delivered in the Business Objects solution and its available in Universe designer (Tools – Translation Manager). • An interface designed for in-house translations. • A format editor to easily define custom date, time, and number formats. • Ability to manage approximately 130 locales. • Enterprise deployment, with full integration with SAP Business Objects Enterprise including support for all Central Management Server (CMS) authentication modes and a standalone mode. • Mid Market (Small-scale) or Local deployment with no repository. • Collaboration with external translators using XLIFF (XML Localization Interchange File Format) files. This format is used by professional translators and is compatible with many translation tools. • Ability to perform concurrent and offline translation. • Support of the translation status throughout the translation process. 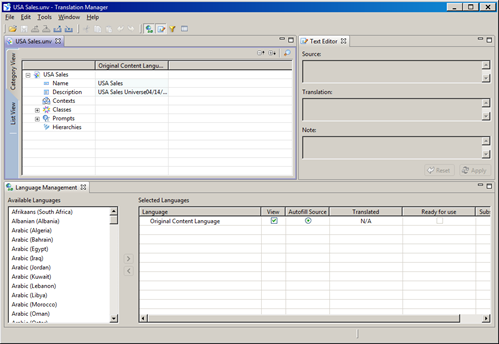 • The translation management tool runs on Windows platforms, though it can connect to Central Management Server running on other platforms. • The XLIFF standard used in this tool is not compatible with previous versions of the translation management tool. In particular, it is not possible to read XLIFF files generated by previous versions of Translation Manager. • Resources stored locally or in the repository: Interactive Analysis document, universe design tool universe (.unv). • Resources stored locally or in the Shared Projects folder (in the repository): the Business Layer and Data Foundation for universes generated by the information design tool. • Resources stored only in the repository: dashboards created by Dashboard Design and workspaces created by BI work-space, Crystal Reports documents, and most InfoObjects. Note: A universe or report designer can create one document and translate it in multiple languages with the translation management tool instead of creating a universe or document in each language. For more details about Translation Management Tool, please Click here. ← How to create Universe using Stored Procedures?